Our Trident Brand of equipment starts from the ground up - at a place where intelligent design intersects with innovative technology and exceptional engineering to deliver superior cleaning equipment. Cleaning equipment that lowers your total cost of ownership, reduces your cost to clean and improves cleaning results. It's what you expect out of your equipment investment, and it's what we deliver. Ergonomically designed, adjustable padded seat delivers hours of stress-free operation. The operator can position the seat for maximum comfort and safety. Maximum leg room and a steering wheel that's closer to the operator makes the machine even more comfortable to use. The foot rest zone is designed to offer ample space for the feet within the compact dimensions of the machine. The lateral paddles provide greater control over the machine for total peace of mind and a comfortable, safe driving experience. The lowered foot board facilitates easy access from both sides and allows the operator to sit comfortably. Parts that should be cleaned daily are color-coded in yellow. This saves time and makes sure your scrubber is kept in perfect condition at all times. LED's light up the areas that may require operator inspection. Battery and tank weight is evenly distributed over the heavy-duty rear axle providing more drive wheel traction. Easily climb ramps with an 18% slope. Better traction enhances safety and reduces potential for slipping. Frees up the dual front-wheel to deliver precise steering to turn and clean in any direction. The dual front-wheel reduces the specific pressure exerted on the floor, making the steering action lighter. It also increases maneuverability and prevents marking, even on the most delicate floors. When the machine is idle, the brush motor, vacuum motor, traction and detergent pump will turn off automatically, reducing costs and environmental impact. All the functions are reactivated automatically as soon as the operator accelerates. Electronic tri-level pressure tackles even the most stubborn soils by applying up to 243 lbs. of brush pressure. 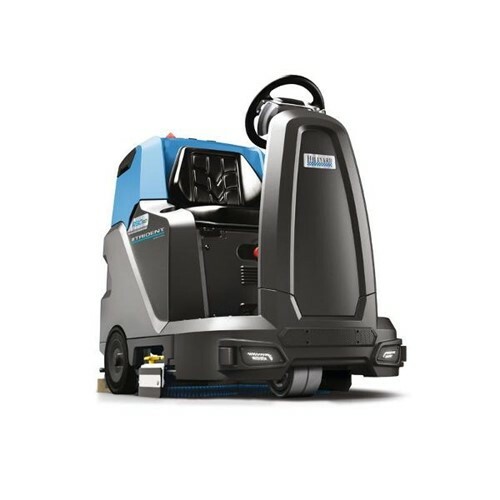 Activate the Power Mode to increase the delivery rate of detergent solution, boost brush pressure, and increase vacuum power to tackle heavy duty cleaning. Let Power Mode run for the full length of its 60-second countdown clock, or stop it with a touch at anytime. Anti-Collision System - The anti-collision system detects obstacles when reversing, helping the operator work in complete safety and protects the machine. Emergency Stop - By pressing a single button the machine stops immediately. LED Lighting - Front and rear LED headlights maximize work safety in all conditions. Descent Control - Maintains a constant speed and prevents a sudden increase in speed when driving downhill. Steering Wheel Controls - The steering wheel controls offer the operator even greater control when cleaning. Also improves safety by eliminating distractions and letting the operator keep his or her eyes on the path ahead. Rear-View Camera - Rear-view camera lets the operator monitor cleaning results in real time from the display, without taking his or her eyes off the direction of travel. Stop & Go Control - The traction control system, which brakes and holds the machine when the accelerator pedal is released, provides assistance on both uphill and downhill gradients. ESC - Electronic Stability Control - Automatically reduces speed when turning without the operator using the brake. The Eco Mode function helps conserve water, detergent and energy by using only the quantities you need and nothing more. Productivity: 43,000 Sq. Ft/ Hr.